Benedict Arnold is one of the most controversial figures in American history, and one of the most written about figures of the Revolutionary War. 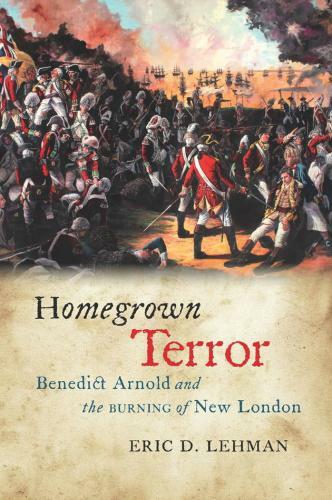 In Homegrown Terror, Eric D. Lehman examines one of the lesser-known acts of Arnold’s apparent treachery, the burning of New London, Connecticut, in September 1781. Lehman, a literature professor at the University of Bridgeport, attempts to place Arnold in a network of prominent Revolutionary figures in order to better understand the burning of New London and its effects on the American psyche. Lehman casts a wide net over a vast array of characters in his book, including Silas Deane, George Washington, and George Turnbull, but the character of Arnold is often spectral rather than actually present through large stretches of the book. Indeed, Arnold disappears in several chapters, with lesser characters providing the narrative thread that ties the book squarely to New London. In the chapters where he does appear, the traditional Arnold narrative is largely on display, with Lehman painting him as an over-ambitious narcissist who betrays his cause for personal advancement. Scholarship on Arnold, including excellent biographies by Willard Sterne Randall and James K. Martin, have proven that the reasons behind his treachery are far more nuanced than Lehman suggests here. Ironically, the best chapters of the book are the ones in which Arnold is a secondary character. Here, Lehman provides excellent context to Arnold’s treason and to provide a rich view of Connecticut life during the Revolution. Unfortunately, the chapters on Arnold lack the substance of the chapters on Connecticut society. This makes the structure of the book itself problematic. The book is largely arranged chronologically, looking at different phases of Arnold’s life and legacy. The first two chapters look at Arnold’s life in Connecticut as a shopkeeper before the Revolution. The next three chapters look at the first years of the Revolutionary War, and Arnold’s involvement in it. Arnold’s treachery does not appear until page 85, quite late for a book with only 203 pages of text. The final seven chapters look at Arnold’s treachery and the American response to it. In his introduction, Lehman insists that the burning of New London “would define the American soul” (xi). Unfortunately, Lehman gives only a chapter to describing the effects of New London’s destruction on the American cause. The sixteen pages he gives to the memory of New London is certainly not enough to suggest that the event had any distinguishable effect on the American cause, let alone the new nation’s soul. An “original” contribution that Lehman does make to the historiography of Arnold is labelling the man a terrorist. To Lehman, the fact that Arnold purposefully attacked a town that he knew intimately was part of a British campaign of terror. This is problematic, as both sides committed acts of violence that could be defined as terrorism during the Revolution. Lehman largely sides against the scholars who have suggested that the Revolution was a civil war, and he certainly does not see Arnold as a loyalist in any way. Indeed, in only seeing the British and their loyalist supporters as the other in the Revolutionary narrative, and the only ones that committed any real “terrorism,” Lehman fails to portray the complexities of the conflict to his readers. Lehman’s literary skills are undeniable and he deftly illustrates Arnold’s world in Connecticut for his readers. However, there is a lack of strategic insights in his work. For example, no reason is given for New London as a target except Arnold’s vindictive desire for retribution. Also, the burning of New London and the attack on Fort Griswold, the climax of Lehman’s narrative, only receive two short chapters. Thus, while Lehman does admirably in placing Connecticut in a revolutionary context, readers that want to understand more about New London’s destruction in American memory, and Arnold’s place in it, will likely be disappointed.